Fashion News: Barneys Is Opening? Send in the Mannequins! BlackBerry camera phone in hand, I was one of the estimated 150,000 visitors who flooded into Scottsdale Fashion Square over a fabulously long four day weekend. While bargains were to be found for the financially fashion focused, the October 15-18 event was centered around the grand opening of Barneys New York that coincided with the unveiling on the mall's east-wing expansion. Yet like many individuals hit hard by this recession, it wasn't couture I was craving nor as a writer, the always appealing idea of people-watching and window-shopping that found my car navigating towards the Square. 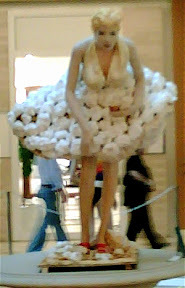 No, instead, I was there to witness the mall's Cinderella transformation from a temple of credit card debt waiting to happen into a temporary fashion museum as modeling mannequins took Scottsdale by storm and Fashion Square became Arizona's very own version of the Heidi Klum/Tim Gunn hit Project Runway. Sponsored by Arizona Foothills Magazine, the refreshingly democratic, all-encompassing, diva-free event which garnered nearly one hundred entries from students, business owners, organizations, and Barneys' creative director Simon Doonan alike may have been titled "The Mannequin is Our Muse" but it was evident when you wandered around each and every design that the artists all had their own distinct muses they were channeling. Whether it was our very own dessert magician Tammie Coe who combined the mouth-watering white frosted cupcakes she creates as the "visual" structure for her inspired homage to Marilyn Monroe's iconic subway grate shot from The Seven Year Itch or businesses which presented us with images of loyal shoppers or tourists, it was a creatively sumptuous feast that I couldn't help but document as soon as I spotted a mannequin's dress comprised entirely out of colorful drink umbrellas. Incorporating found art, newspaper designs, dyes, mixed media and all sorts of textiles, flowers, and paints, the exhibit moved freely with no repetition (at least in their placement and juxtaposition) as I explored every look and era imaginable from a mermaid to a few designs that wouldn't be out of place on AMC's Mad Men as well as one that looked like it had escaped from the set of Sofia Coppola's Marie Antoinette. Although it was a professionally judged event and the Top Five winning mannequins will be on display at Scottsdale Museum of Contemporary Art throughout the rest of the month and you can additionally vote here on the Arizona Foothills website, I couldn't resist snapping as many pictures as possible to give you an idea of what the display diversity was really like. Since I was simply using the BlackBerry, not having anticipated I'd be so swept up in the experience, you'll have to forgive some of the out of focus angles and poorly lit shots. For, no matter how much I tried to touch them up, I'm unable to duplicate the best lighting inside Fashion Square, which in my humble opinion just so happens to exist in the women's restroom of Neiman Marcus. The Neiman lighting is not only the cinematic equivalent of magic hour but if it escaped out of the restroom and was released around the rest of the globe, I'm confident that it would no doubt result in people finding everything they encountered to be as beautiful and fascinating as I found these mannequins pictured below.